This post brought to you by Rug Doctor. The content and opinions expressed below are that of Carrie Elle. We’ve lived in this house for five years now. And that means five years of kids, pets, and spills all over our carpets. No matter how hard we try, our floors get dirty. No matter what we do to stay on top of the messes, they seem to always get away from us. That’s just life in this house. But after five years of living in this home, we’re also at a point where we’re ready to *really* start decorating and making it pretty. And that starts from the ground up. Cleaning the carpets is just one of those things that gets pushed aside. We never have the time, the money, the energy, to really get it cleaned (even though it should be a top priority). But with the holidays coming up and with the home improvements we’ve been working on, we needed to get the carpet cleaned. And I should also mention that we are on a tight budget. So, rather than hire it done, it was time for some DIY carpet cleaning. The rental is only around $30, but we also stocked up on two different types of cleaners, bringing our total to right around $50. 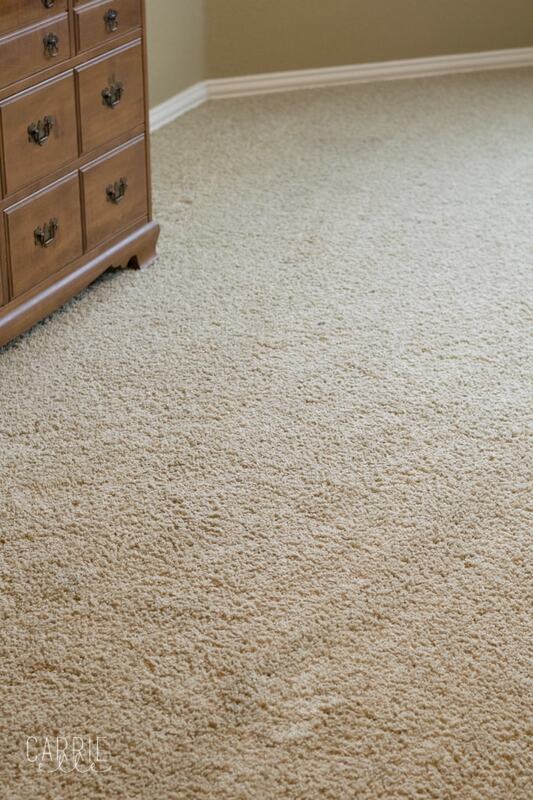 When you take into consideration that it can cost $200 to have your carpets professionally cleaned, this is a steal (and we’ll keep the cleaners for future spot cleaning and stain removals). The best part, though, is that this machine is really easy to use. In about 40 minutes, we cleaned our (huge!) master bedroom and the entryway rug. Factor in the super easy pick-up and drop off of the machine, and we spent just about an hour total on this project. You can also use a Rug Doctor on upholstery and mattresses, which is good to know! The Rug Doctor gave us a professional-grade deep cleaning to our sad, stained carpet. The results were immediately obvious (it cleaned up some tough stains! ), but we noticed even more improvement after the carpet had dried. The room (and the entryway!) feel fresher, cleaner, and brighter. Honestly? This is one of those things I wish we’d done long ago. The amount of time and effort that went into this is minimal compared to the results and how much of a difference this made in our room and our entryway. Maybe the best part is that we have beautiful, clean, “new”-feeling floors as we go into the holiday season and the new year. They make the perfect canvas for the improvements we want to make in the house, and I feel good about having people over. You can find a rental location near you by clicking the link. This cleaning method is economical and useful. Thank you Carrie. I had forgotten about the Rug Doctor Method. Awesome! I had no clue you could rent a Rug Doctor from Walmart. And the improvement is so obvious! I’ll have to try this, thanks for sharing! I understand where you’re coming from with budgets, and you just showed us a great way to deal with it. How often did you have to replace the water? The mat looks ravishingly awesome.. I am totally in love with it!!! Great cleaning tios as well…. First, congrats on your newly cleaned rugs, they look fabulous. It’s a great idea that you rented the Rug Doctor, instead of buying it. I love that you also showed the products you used to help you clean the stubborn stains on your rug. Will rush to the nearest Walmart and have a go at your DIY suggestion. Cheers! Cleaning leather sofas is slightly different to fabric, but again, you should always check the care label before trying to clean the sofa yourself. Hi Carrie. you did a great job cleaning your carpet. It looks a few shades lighter now. What I really love is your yellow throw rug. You have great taste.